For comprehensive electric service from a company that puts the customer’s needs first, look to VMA Electric. We serve businesses and homeowners throughout the Brookline, Massachusetts, area, and we are committed to providing the highest level of service possible and an overall pleasant experience for all of our customers. We were founded in 2008 by Victor Archila, who is personally involved in every job we do to ensure that we always meet the high standards that our customers deserve. 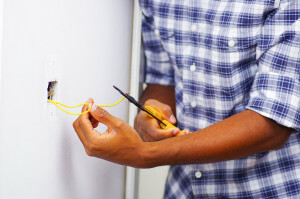 Experience – Our electricians are licensed and average more than 10 years of experience. Training – Our technicians are well-versed on current industry best practices and stay up to date on the latest technological advances. Attention to detail – We focus on precision and – whenever possible – send an electrician who is a specialist in the particular type of electric service your job requires. At VMA Electric, we provide a wide variety of services for both commercial and residential clients, including new construction wiring, whole-house rewiring, indoor and outdoor lighting installation, security system installation, audio/visual wiring, phone and data wiring, and much more. We also have an electrician on call to provide 24-hour emergency service in case something goes wrong after normal business hours. To learn more about the comprehensive electric service we provide in Brookline, MA, and throughout the MetroWest area, contact VMA Electric today.